LeBron James is about to hit the free-agency market and stay right at home. James declined his player option for next season with the NBA champion Cavaliers, but the finals MVP has made it clear he has no intention of leaving Cleveland anytime soon. He had until midnight Wednesday to pick up the option, which would have paid him $24 million next season. The 31-year-old superstar has been a free agent the past three summers, electing each time to sign two-year contracts with a player option for the second season. It’s not yet clear if he’ll sign another short-term deal or a multiyear package. His agent, Rich Paul, told The Associated Press there is no timetable on when James will re-sign or what type of contract he'll pursue. With the league’s salary cap poised to swell dramatically in 2017-18 thanks to a $24 billion TV deal, James may opt for another short-term deal and seek a maximum contract next summer. James’ decision to go year to year has allowed him to maintain flexibility while keeping pressure on Cavs ownership to continue to add quality players. The Cavs, who won their first title — and ended Cleveland’s 52-year championship drought — by becoming the first team to overcome a 3-1 deficit in the finals, have Kyrie Irving and Kevin Love under contract for three more seasons. Also, forward Tristan Thompson has four years remaining on his contract. Before a massive celebration parade last week, James told reporters he’s coming back to try for a repeat title. 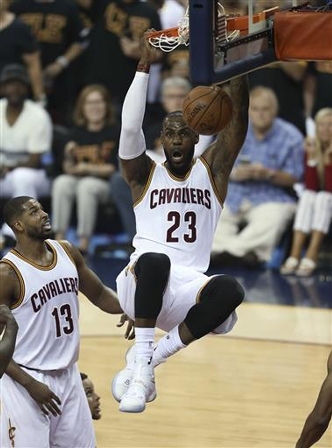 Later, he told the crowd at a rally honoring the Cavs, “Let’s get ready for next year.” Appearing in his sixth straight finals, James was a unanimous choice for MVP after leading the Cavs to three straight wins to stun the favored Golden State Warriors, who won a record 73 games during the regular season.